So I didn’t post last week’s mani because, despite loving the base color (OPI Schnappes Out Of It!) and getting nearly flawless coverage in only one coat, I proceeded to eff it up by attempting a glitter gradient on a couple of accent nails with a gold micro-glitter that was way too dense to work as a gradient. The color combo was gorgeous, but it ended up looking clumsy and heavy. Then that one-coat base started chipping after only a day and a half even after using seche vite as a top coat, and by wednesday I was pretty done with the whole thing. I dealt with it until Thursday and then took it off and went bare-nailed until Sunday, which felt weird, let me tell you. This week, though… Can we talk for a minute about how much I LOVE this polish? Rainbows ahoy! I can’t take how beautiful this is, seriously. 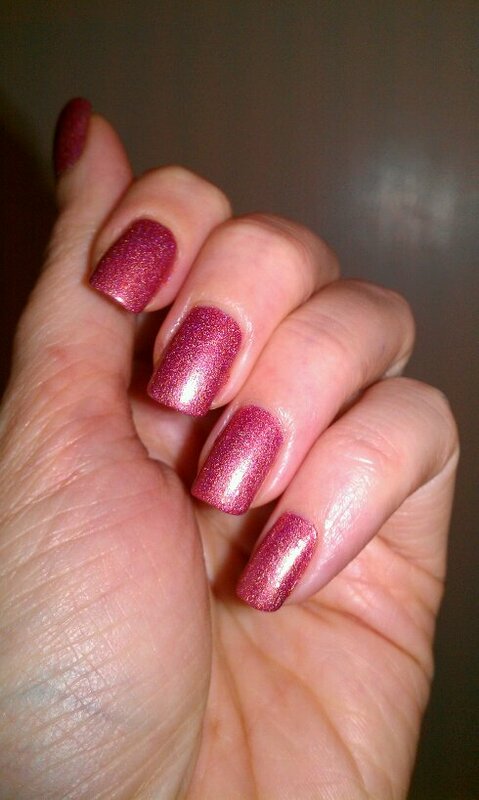 And not only is it stunning to look at, but it applied really cleanly and was opaque in 2 coats. I wound up with a few air bubbles on a couple nails (and a LOT on my thumb, for some reason) but I’m 99% sure that’s my fault – I was a bit unnecessarily finnicky with the second coat and caused some dragging. I should note, though, that like last week I’m already getting small chips and tip wear, which is annoying. I find almost all of my shimmer polishes have a fragile finish like that and I really don’t know why. I just hope I can baby this mani and make it through the week without disastrous damage, because right now I don’t ever want to take this polish off! 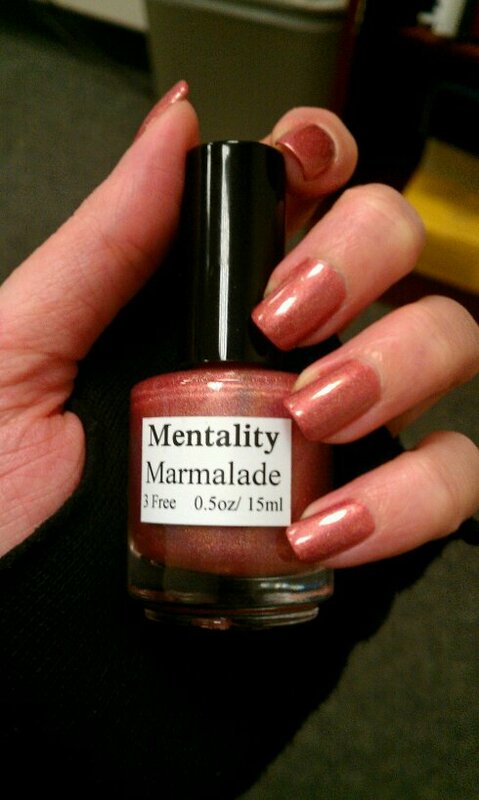 When I bought this I also bought two of Mentality’s shimmer polishes, and now I can’t wait to try them out. If they’re anywhere near as good as this, I might find myself with a new addiction. Back to the Julep polish again this week. I got Ciara as an add-on to my October Maven box and couldn’t wait to try it out – the only reason I didn’t wear it last week is that it felt like a truly Halloweeny polish and I wasn’t quite ready to rock the gothic look yet. Now we’re two weeks out, though, and that’s close enough for me! This polish is virtually impossible to photograph, and I’m a pretty terrible photographer to begin with, so excuse the ugly photos. Please also excuse the messy application; this one was a little challenging. I was expecting Ciara to be more overtly pink/magenta/purple than it is; the swatches on the Julep site certainly looked that way. Having used it now, I don’t think there’s any way to get that result unless you only apply one thin coat; this is two normal coats and its so dark in most lighting that it looks black. The photo above actually does a decent job of catching the wine-to-teal color shift that happens when the light hits it just right, which is gorgeous, but the general look is just a tad heavy for my tastes. I also had a hard time with application; the formula seems to sit in a tenuous balance of thin and thick, so that its difficult to get the right amount on the brush. I ended up either flooding my cuticles (two much) or having bare, streaky spots (too little) and found it difficult to get it right. I’m not sure why but this took FOREVER to dry; two hours after I applied my top coat I was still having to be careful of dings and smudges (and was not successful at avoiding them) and this morning I not only had ugly sheet smudges, but several nails had developed big air bubbles overnight. I tried to even everything out with an extra coat of top coat this morning, but it can’t fix everything. Overall I’m kind of disappointed by this polish and I doubt I’ll last the week with it on my nails… the imperfections are going to drive me up a wall. Next time I might try a thin coat over a deep pink or pinky-purple to bring out Ciara’s base color and see if I like it better. Over the last 6 months or so I’ve slowly become more and more obsessed with nail polish. In high school I painted my nails at least per week, but over time a weird combination of busyness, laziness, and a rebellious streak where I rejected anything everything GIRLY put a stop to that habit. 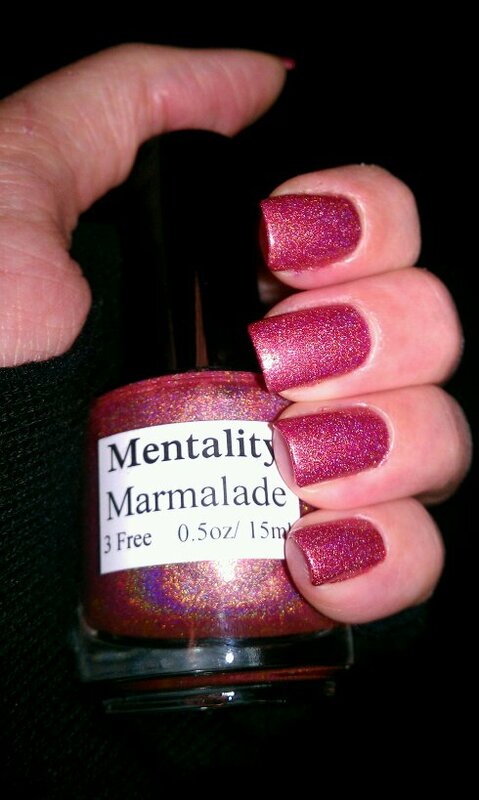 Then this year I discovered that indie polish was a thing, and fan polish, and people selling polish on Etsy. I discovered that the world of polish had gotten INSANE in the best possible way, and my obsession with wearing color and art on my fingers reared its head again. Now I’m back to giving myself a new mani every week, and its kind of amazing how much more feminine I feel. Stupid, I guess, but I enjoy it. This week’s mani is an all-Julep affair. (Their Maven program is EVIL, I tell you – my polish collection has doubled since I joined.) The base color is Winona, a really lovely mid-range warm gray that has a richness and depth I don’t expect from grays. Its a good formula: neither too thick nor too thin, relatively self-leveling, and very nearly opaque in one coat though I applied two to be sure. It dries a little dull so top coat helps if you’re like me and live for wet shine. Though I love it as a good, autumn-appropriate neutral, Winona is just a tad boring on its own, so I spiced it up by taping off some pink stripes using Julep Joy (discontinued, sadly – its a gorgeous rosy shade) and glitter accents using Julep Mila. I think this is the perfect use for Mila for me – its quite a glitter bomb and using it on a full mani would be too much for me. I don’t typically bother with nail art like this, but this is simple enough to match my usual style while still having a bit of flair. Edited to add: After I published this I realized I’ve inadvertently painted my nails to almost exactly match the colors of my blog layout. I swear this was unintentional, but certainly appropriate given my recent rededication to this thing. Hopefully this is a sign of good things to come! 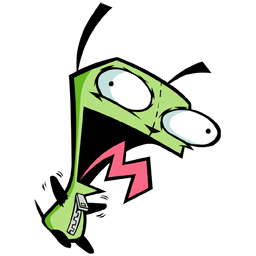 After several years and multiple failed restarts, I think perhaps its time I just admit a simple truth: I am an absolutely awful blogger. I always start out with the best intentions, but can never quite follow through. Here, at eri-chan*eats, I thought setting myself a bunch of very public goals would motivate me to actually meet them and keep up with this thing for more than a couple of months. Of course I haven’t, and the longer I’ve been away, the harder its been to come back. The 5 months of silence became an intimidating wall between myself and this blog, and I was almost afraid to come back and admit, to myself and to anyone who may have ever read my posts, that I failed. But no matter how many times I fail, I always eventually come back to this whole blogging thing, and its because at the end of the day I really do enjoy it. So maybe its time to stop trying to force myself into a model that obviously doesn’t work for me, and just accept that I’ll never be one of those people who blogs 5 times a week and has hundreds of followers. I’ll never get KNOWN for this thing because I just don’t have the dedication to put that much effort in, and really that’s just fine – I’m writing for me and for my friends who like to see what I’m cooking and eating and discovering, so who care how many other people ever read? So from now on, I’m just going to write when the mood strikes me, and not feel bad about it. That means my goal to write every two weeks is going out the window, but that’s ok. Most of the other goals I set for myself for this year can still be met, and I still want to try, but I won’t beat myself up if I don’t get to them all. After all, there’s always next year! All that being said, there are actually some valid reasons why I haven’t been blogging these last few months. Simply put, for awhile there, life just got a little too crazy for me to spend any time here. In May, my sister and I threw a surprise party for our parents to celebrate their 30th anniversary, and I catered the whole thing myself, including the cake. It was a lot of fun and the party went really well, but planning and cooking for it pretty much consumed my life for two months beforehand. A month later, my family and I went on an epic trip to Arizona and hiked to the bottom of the Grand Canyon. It was an incredible experience but, again, took a lot of my time and attention before hand for training and preparation. For the rest of the summer its been one thing after another: my best friend and her husband moving out of state; weddings; family parties; work craziness. 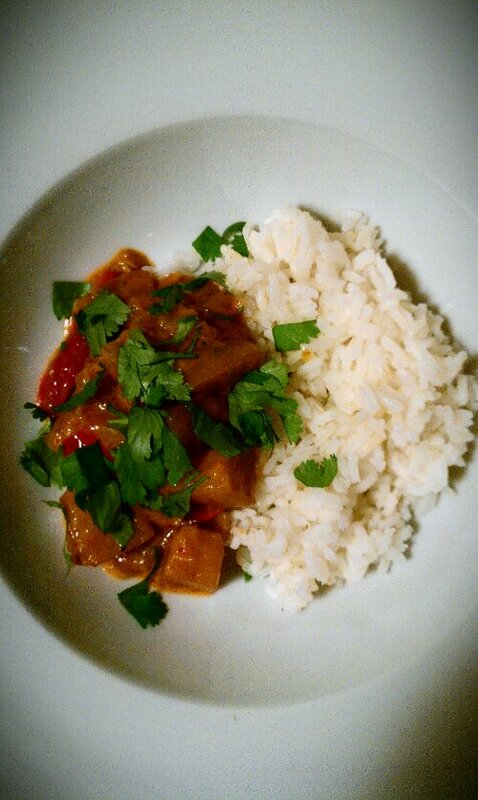 I’ve also been doing a lot more of the meal planning and cooking on my own lately. I’ve never really talked about it publicly before, but last year Justin had an accident which left him with a potentially permanent seizure condition and a lot of residual health problems. Over a year later there are still a lot of days where he just doesn’t feel up to doing much, and when I’m also working overtime or having to take care of the cleaning and chores and errands on my own, a lot of times I just don’t have the energy to put a lot of thought and effort into what we’re eating. I/we still shop and plan our meals every week, but its always a toss-up whether or not we’ll actually be able to stick to it. Many times, we don’t. And to top it all off, at the beginning of the summer we got a notice from the management company for our apartment complex, officially banning the use of open-flame grills anywhere on the premises. Everyone in this complex has a grill on their porch or balcony, but they’ve all been sitting cold and lonely since May. Most years we practically live off grilled chicken, pizza, and vegetables in the summer, but not this year. I think we may have had one dinner of grilled burgers and dogs before we were cut off. Honestly, what fun is summer when you can’t grill? The end result of all this is that, quite frankly, there just hasn’t been terribly much on our plates that’s worth sharing. There’s been plenty of good, even delicious food (because life would be unbearable otherwise!) but very little that I’ve felt compelled to come here and blog about. 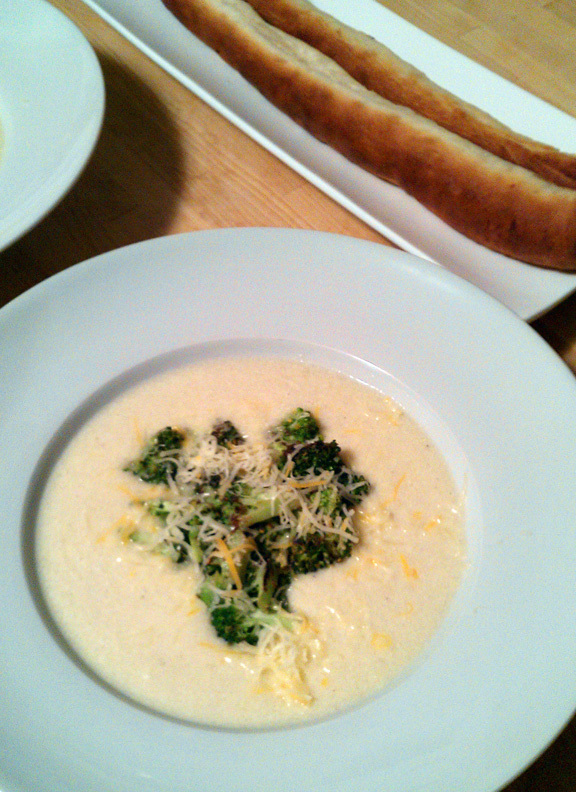 Which brings me to this broccoli soup, which we made for dinner last night. I don’t really know why this soup suddenly inspired me to write. 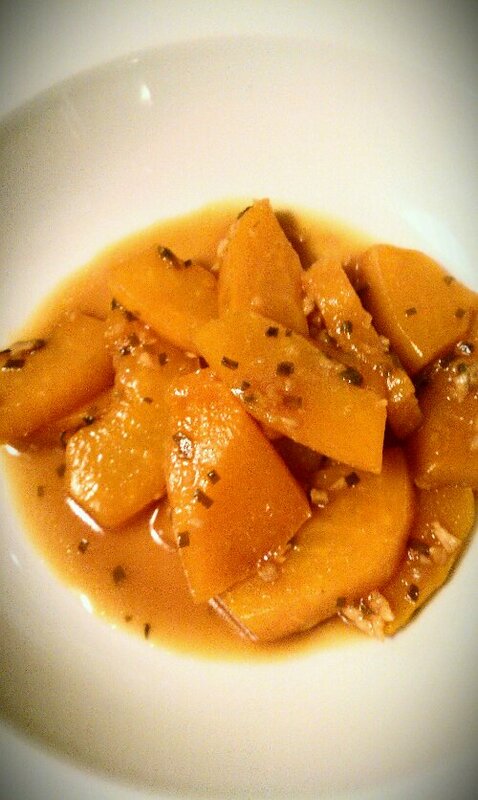 But at some point in the process of sauteeing, simmering, pureeing, and plating, I found myself excited to blog again. There’s nothing special about this broccoli soup, really. Its delicious, of course, but its just like dozens of other pureed vegetable soups I’ve made over the years. So somehow I don’t think the motivation came from the soup itself. 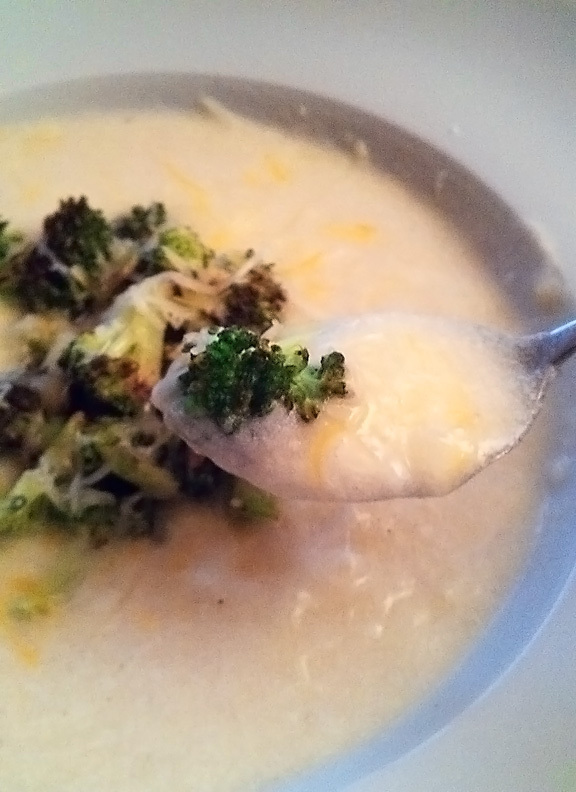 Maybe it was the bolt of inspiration which led me to reserve the broccoli florets, caramelize them, and use them as a topping, rather than simply blending them up with the soup base. Maybe it was the way that one extra touch and a little extra thought elevated a humble bowl of soup to something just a bit more special. 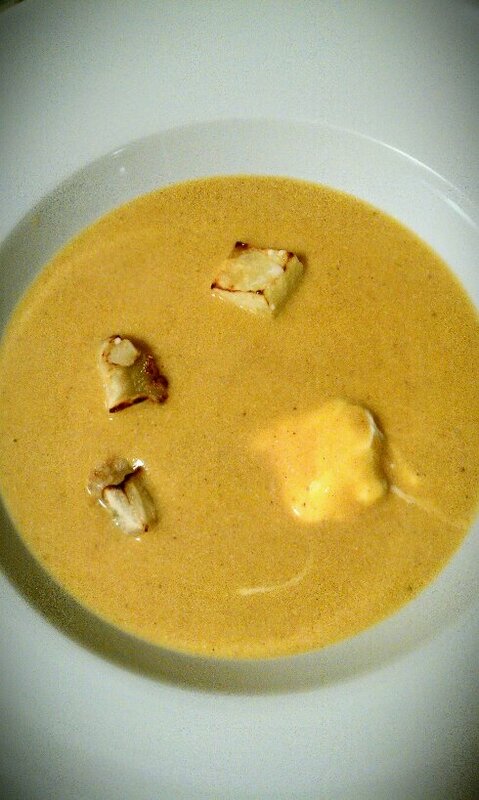 I love a smooth, creamy soup as much as the next person, but the slightly crunchy, sweet and nutty florets on top, combined with tangy, melty cheese, turned what would otherwise have been a tasty but boring dinner into a much more exciting dish. Maybe it was the sudden chill in the air that’s settled over New York in the last couple of days, signaling the end of summer and the beginning of my favorite season, and the simple comfort of dipping our toes back into warming, hearty cold-weather fare. And maybe its this change in the seasons that’s giving me the sense of being at a turning point, with the busy, crazy times behind me and long stretch of unplanned quiet ahead. Maybe its the obvious changes in the world around me that makes me feel like I can try again, start over, and get back to the things I love: cooking, eating, and being creative in the kitchen. Whatever the reason, this soup felt special enough to share. I’m glad to be back. To prep the broccoli: Separate the florets into small pieces and set 1/2 cup aside to be caramelized for the soup topping. Peel the tough outer layer from the stem of the broccoli and chop, adding to the rest of the florets. Heat 1 tbsp of the olive oil in a medium-sized saucepan over medium heat. When the oil looks shimmery, add the onions and garlic and sautee with a pinch of salt until they begin to soften. Add the chopped potato and broccoli and sautee until the broccoli begins to turn bright green. Add the bay leaf, bouillion cube, and water. Reduce heat to medium-low and simmer until all the vegetables are soft enough to smash against he side of the pan with a spoon with little effort, probably around 30 minutes. Remove from the heat and set aside to cool a bit before pureeing (tossing hot soup in a blender is just asking to have soup explode all over your kitchen). While the soup cools, heat the remaining olive oil in a heavy skillet (cast iron is ideal) over medium until shimmery. Add the reserved broccoli florets and spread out in a single layer, sprinkle with salt and pepper, and cook, stirring occasionally, until the broccoli is brightening in color and beginning to soften. Crank the heat up to high and cook without stirring for a minute or two until the broccoli turns golden brown and crispy on one side; stir and repeat until the broccoli is well caramelized (not burned!) and tender-crisp. Remove from heat. Remove the bay leaf from the soup and pour it into a blender, add the greek yogurt, and puree until smooth and creamy. Pour the soup back into the saucepan (through a fine strainer if you like) and place over low heat to rewarm and adjust seasoning. I found that the bouillion made the soup plenty salty, but that a few generous grinds of black pepper were both needed and welcome. 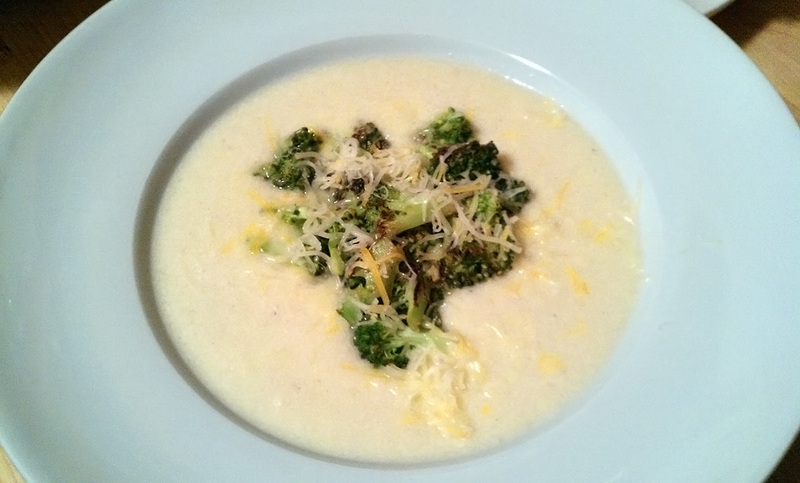 Divide the soup between two bowls or shallow soup plates, as we’ve used here, top each serving with half the caramelized broccoli, and half the shredded cheese. Justin sprinkled his with some smoked habanero chili powder and pronounced it excellent; I’m a wuss when it comes to heat, but think that a milder variety of chili or some crushed red pepper flakes would be a tasty addition. 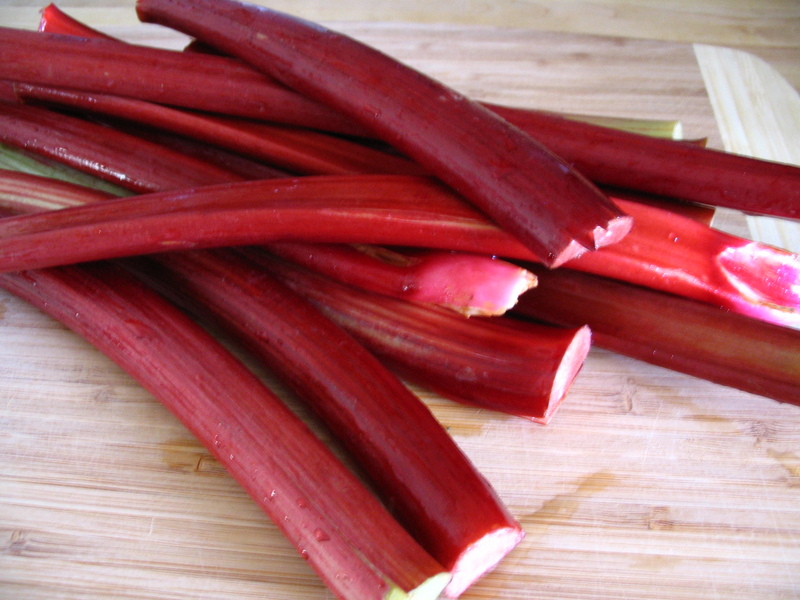 Serve with warm, crusty bread for dipping. We enjoyed this with some prosciutto-stuffed bread sticks from our local farmers market, and although I suspect I could’ve done a better job if I’d made them myself, the salty, meaty prosciutto in the bread went a long way toward making this a more satisfying dinner.